Monday morning, interview morning. Coffee ready, looking busy at work while "doing research"? Good. The interview of this week is with Tim Marshall from enLIGHTened equipment. Tim is most famous for producing the “World’s Lightest Quilt” which is made of Cuben. While enLIGHTened equipment is at the moment still in start-up mode this is such an interesting venture that I decided to interview Tim and hear more about what we can expect from him in the future! Tim on a canoe trip in Algonquin Provencal Park. Tim, since when are you backpacking, and how did you start? How often are you out backpacking nowadays? 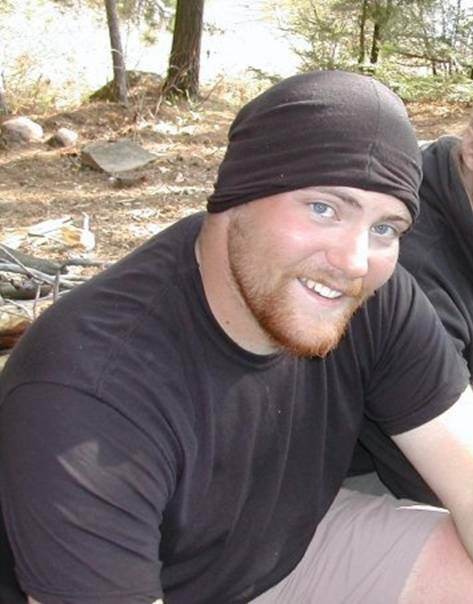 I went on my first backpacking trip in 2003. My wife (then girlfriend) and I went to the Smokey Mountains for spring break. She had done a lot of Backpacking and in the past had worked leading wilderness trips for youth groups, so she introduced me to the sport and I caught the bug right away. Of course we were each carrying something upwards of 65lbs. It has been over a year since I have got to do any multiday hiking. A few years back I was going at least monthly from spring to fall, but those days are gone for now. I grew up spending my summers in the canoe with my dad fishing for smallmouth bass all over northern Michigan and by the age of 12 was taking multi-week trips into the Quetico Provencal park in Ontario Canada. So even though backpacking and modern gear were new to me I had a ton of experience in the wilderness and the transition from paddling to walking wasn’t a hard one for me. I still tend to get out more in the canoe then on the trail. This summer I was on the lake or river fishing at least a few days a week and in May took a multi-day trip in the Boundary Waters with some friends. So, even though I haven’t had the opportunity (or made the time) to do any backpacking recently I have still gotten out and for me that’s what it’s all about. Why did you start with UL backpacking and making your own gear? I went for an overnight hike with some friends to the Manistee River Trail in Michigan. Two of the guys I went with were on the verge of being ultralight, I’d say they were definitely lightweight hikers at around 20lbs, where I was carrying almost 35lbs for one night. After seeing their comfort on the trail and how they didn’t sacrifice too much in camp I was definitely interested in learning how to reduce my pack weight. So like nearly everyone else the major transformation for me came from reading Ray Jardine’s “Beyond Backpacking.” I got a bunch of his kits and borrowed my wife’s sewing machine and following Ray’s instructions I learned how to sew (never done it before that point) and made myself some gear that helped me start my passion for ultra light and super-ultra-light hiking equipment. I liked Ray’s pack features, but found the construction to be overly complicated. I made a bunch of packs each with improvements to the construction process. The packs I use today still have a lot of the same features of the Ray-Way Pack (as do many other UL packs of today) but I make them in a much different way than Ray describes. enLIGHTened equipment is your little cottage in start-up mode, can you tell us a bit more about it, what the plans for the future are, and if you hope to be able to make a living of it some day? I’m not really sure what to say. I started selling gear in 2008 to pay for a move and I just kept getting orders. I had to take a long break after the move as we were living with friends until we could find a house. So once I got all settled and started sewing again it seemed like I always had a few orders to do. I enjoy the work and creative process so I decided to make a website to make it easier to get in touch with me and to showcase what I have made. After a few months I wanted people to be able to order from the site as I was getting swamped with tons of e-mails and most didn’t result in orders so there was hour after hour of time spent that wasn’t getting paid for. Putting all the info on the site has really cut down the amount of information I have to produce for people on a daily basis making my life easier. I am not really sure what will come of all this and at this point that is ok with me. I do have a long order queue right now which is great, but it brings with it a lot of pressure to get gear out in a timely manner. My wife and I are currently working on a plan to allow me to quit my job hopefully in the next six months. This will allow me a lot more time to fill orders and work on prototyping and testing some designs I have that I just don’t have the time to do anything with right now. So, I would like to do this full time but am in no rush to do so. If it happens it happens if not, no worries. I think before I get too much further down the road I should actually learn how to sew. I have seen that your cuben sleeping bag is making already a name for itself; besides on BPL I've seen it on Suluk46 and on the Japanese ulgear blog. 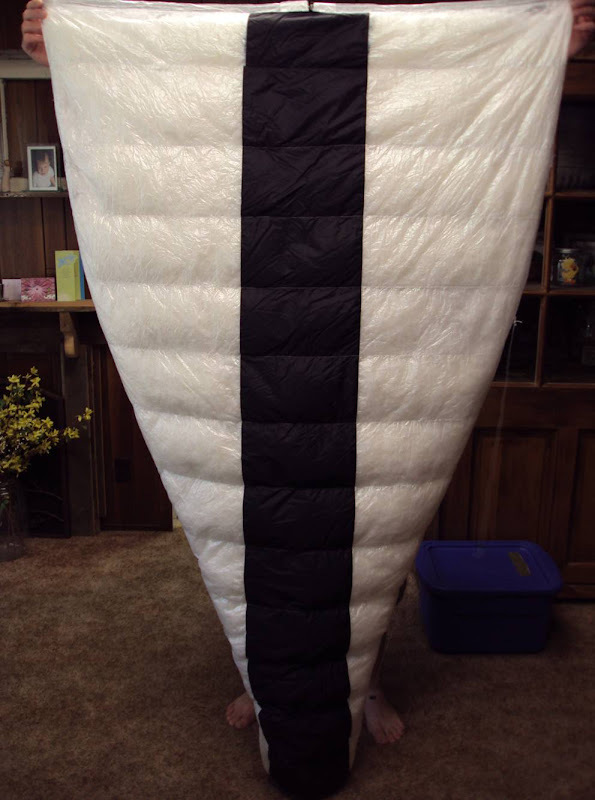 How long does it take you to make one of these great sleeping bags, and how did you get the idea to make them? I figure about 10 hrs to make one of these, but in reality there are many more hours involved as I can never just work hard straight through. I watch my 2yr old daughter during the day (I work evenings) so I do all my sewing while trying to keep her out of trouble. IT makes everything take a little longer than I’d like but that is just how it is. The first ever Cuben Down quilt, which belongs to Steve Evans - check out the video! 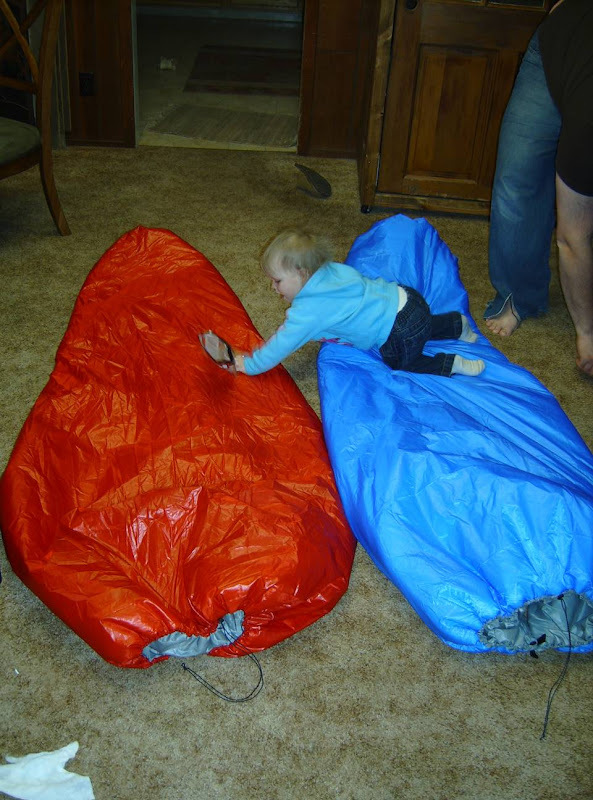 The idea for the Epiphany (Cuben Down quilt) came from Steven Evans of Suluk46. Steve came to me with the idea of a cuben lined momentum shelled down quilt. We tossed a lot of ideas around and finally we decided to give a cuben lined, cuben shelled (with a stripe of breathable momentum 90), and cuben baffled quilt a try. I figured that the momentum shell was just to allow the down to loft so I proposed reducing the amount of momentum to the bare minimum and to use the cuben (.33oz yd2) for as much of the quilt as possible. Our goal was to make the lightest quilt possible and what we ended up with weighed just over 11oz with 8oz of 800fill down. This wasn’t the lightest quilt ever, but it was for sure the warmest per ounce quilt in the world which lead to us calling it the “World’s Lightest Quilt”. I have made a bunch of these now, in fact I just finished one today and I have another waiting for down (with one more in the queue). What other gear are you working on at the moment? Can we expect to see enLIGHTened equipment sleeping bags, backpacks, tarps, tents? I have a lot of things drawn up and designs still locked away in the back of my head, but right now I can’t find the time to make them a reality. I have made many Packs, some mids, tarps, tents, tons of quilts so I am constantly getting more experience but I have found recently that packs and shelters take me a lot more time to complete and to try and keep my lead times reasonable I have decided to just make sleeping gear for the time being (which is what I am best at, and best know for anyway). If it works out where I can start doing this more I do plan to introduce some SUL Shelters (1 and 2man) and a SUL pack. I just don’t know when I’ll be able to do so. Being a one man operation and working full time has really limited my ability to make prototypes as with every minute I have for making gear I need to be filling orders. I think that there is already a lot of great UL gear out there and I don’t really have a desire to make more gear that is basically the same thing just so it can have my tag on it (if I ever get tags). When I come out with a new piece of gear I want it to be truly new, and fill a void, not just a little different then what is already available. I think the biggest unmet needs right now are in SUL gear and in transitional gear that helps people move into ultralight. So I will most likely offer both the lightest and the heaviest ultralight gear around with not so much in the middle. As you're still in start-up mode, maybe you can tell us how easy, or difficult, is it to compete versus other quilt manufacturers, like Nunatak, GoLite and Jacks R Better? Or do you not see them as competition, but as other alternatives? I don’t at all feel like I am competing with anyone. I’m just making a few quilts a week and I don’t even have a product that could be considered competition to Nunatak or the Jacks. They make down quilts with breathable shells, the only down quilts I make (unless something custom is ordered) have cuben shells and liners. It has been easy to get the amount of business I have now; I think it will be hard to get the amount of business needed to support me full time. Right now I have about 8 weeks of orders in my queue, I wouldn’t want more than that. I get an order every week or so and that is all I can handle right now anyway. To do this full time I’d have to get multiple orders per day so I don’t feel that the volume of work I am doing currently is any competition to these other guys. I wish that I could produce the quality of gear that they do, I have a lot to learn still. Tim's daughter helps with inspecting the quilts. What is your own favorite stove, backpack and shelter? Did you maybe even DIY? The next one! It always seems that after I make something (within minutes normally) I think of a way to make it better. I have used all DIY gear since 2005 (except when I use a canister stove). One of my favorite stoves is the camp fire. I normally hike where it is safe and responsible to have small fires. I started taking a small aluminum bottle (caribou coffee 12oz) and just sticking it in the fire to boil my water. I stick a ti stake through the lid so I can retrieve it with a stick and that is how I do most of my cooking these days. Every trip (when I was taking trips) I try a new shelter design, a new quilt or a new pack. Since I make them all myself the cost of new gear every trip isn’t too bad. Actually my need for new gear all the time is one of the reasons I kept making custom gear, it pays for my addiction. What was your last longer backpacking trip? Are you trying to get lighter and lighter still, or did you already reach your perfect 3 season setup? I haven’t had the chance to go on many hikes over 3 nights. I am hoping that this year I will get to start my daughter out hiking and I hope that if she likes it I will be able to start getting out again. I don’t believe in perfect, it is an imperfect concept. I believe that taking the same gear every trip is boring. Its more fun to try out new things (even if they bomb) I would only want to take all trusted gear if I was doing a very long hike with limited bail out options. A hike like that isn’t in my near future so for now I try new gear every trip. I do like to try to go light, I have done sub 5 and think I can easily break that with some of the SUL stuff I have in the works, but weight isn’t the only thing that counts. From your point of view, do you think ultralight backpacking will become more popular and break into the mass market, or will it continue to be something for a small group of people? Yes, and no. I think that it already has become more popular. Every day BackpackingLight gets more members and there are always people posting for the first time. So obviously the trend is moving lighter. I don’t think that ultralight will be the norm any time soon, but really that depends on us. We are the ambassadors for the sport, if we aren’t out there helping people see how they can enjoy backpacking with 1/3 the gear they always took before then the movement will stop with us. Blogs like yours, UL dads in scouting, trading packs on the trail, all these things can have an impact on what people think about pack weight. I am not so worried about everyone going UL, as long as everyone is going. I am most concerned with helping people who are unable to hike because of the heavy loads to get back out an experience the wilderness they love in a way that they enjoy. People will carry what they want, that will never change. Even on BPL I see people talking about the giant knives they carry on their sub 5 trips, people will always be people. Are you in touch with any of the other cottage manufacturers, like Trail Designs, Gossamer Gear or ZPacks, and talking about gear developments and the like? Nope, I’m sure I’m not even on their radar. I do talk every so often with Steven Evans of Suluk46 and have bounced some ideas off of him. I have also talked some with Bender of Kooka Bay. I am really only known on BPL (as far as I know), so people who aren’t there a lot probably have never heard of me. I am not really in the game yet. Tim, I thank you for taking the time to answer my questions. Is there something you would like to add? No problem, I appreciate you taking the time to showcase what I am doing. I am probably making gear in about the smallest capacity possible. My living room is my work shop, and I stuff down with a shop vac in my basement, but I am making some unique gear and I appreciate the recognition.